Title: Backup? I don't need no stinking Backup! 2-Walk to the physical server, log in as "sa" (or have IT do this) and click File-Backup. 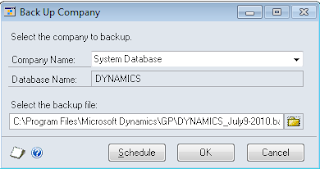 This is an easy way to backup both the Dynamics database and your company databases. 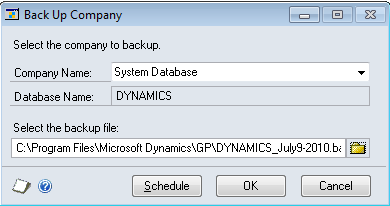 Of course if IT does this, they may perfer to backup using SQL Server, which is GREAT! I like to have an additional company called "TEST" and I perform restores on this database. This has dual purposes, you test your backup and you have a database of your real data that you can play with, and train on without affecting your live data. Q: How often do I have to backup? A: How much data are you willing to lose?